Tuesday, this Brown and Sage Polka Dot Wedding Cake with Fondant Bow stole the show. 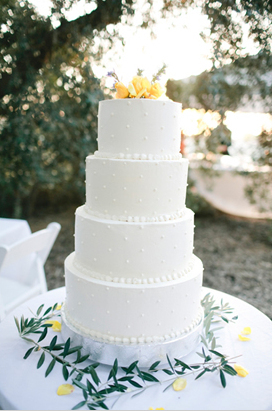 We love old-fashioned touches, like the fondant bell cutouts on this Wedding Bells Cake. Do you love ocean-y things? I do! And I love Cakes by Beth, too. We were super excited to feature her Nautical Love Cake and Cupcakes on Thursday. On Caketopper Friday, we paid homage to the school mascots toppers with these adorable Gator Cake Toppers. I’m playing around with christening Saturday “For the Guys” and featuring groom’s cakes. Thoughts? This Saturday, it was this yummy, craving-inducing Waffle Cake. Now, let’s take a look at the Pretty! It’s in the little details, yes? Austin Wedding Blog shows us some darling details, like tiny picnic baskets and margarita shots! Ah, we should would like to go to a Texas wedding. They know how to party, y’all! Do you have burning questions about Brad Pitt and Angelina Jolie and their engagement? No? Well, just in case you change your mind, E! Online is here for you. I’ve recently fallen completely in love with custom sashes on wedding dresses. Check out these enchanting offering from SparkleSM, as featured on Emmaline Bride. Don’t think you can plan a stunning wedding uber fast? Guess again, and check out Katrina and Jason’s “planned in four days” wedding for inspiration. From Offbeat Bride. We love this rustic wedding featuring BHLDN bridesmaid dresses and the cake above From Wedding Chicks.